Please hover your curser over the verse reference below and see if it works. Wow! OK, maybe it was a fluke. Let’s try again! Wow, it really works! This is cool! It will work with every Scripture verse on my website and blog from now on. I just LOVE good technology!
. . . when the phone ran. It was a familiar voice from Catholic Answers Live. The food smelled great — I was hungry. I had just sat down to dinner after a long and busy day. Yeah, dinner smelled good but I reluctantly set my fork down. So that’s how I got to be the guest on Catholic Answers Live Monday evening. Click here to listen to the archived show on-line. Click here for other listening options. I also promised to provide answers for Questions 2 and 3 on-line. 1) What does Jesus mean about being saved by “belieiving”? What does believe mean and are we saved by faith alone? 2) A smart journalism student at university is losing his faith. What can be given to him to read to convince him of the truth of the faith? I would suggest you get him College Apologetics for a start. 3) What was it like to be shepherds during the time of Jesus and what was their status during the the time of Jesus? 4) What does the Catholic Church teach about “group punishment” as in situations like Sodom and Gomorrah? Are their bad things going on today that could be considered a group punishment from God? 5) What are Anglicans and are they Catholics? 6) What about different Bible translations and what is inclusive language? 7) What books or info can I give to a young girl I am sponsoring for her confirmation? She is not strong in the faith and doubting the truth of Catholicism. I will get to this promised answer soon. The other day someone dropped a “gospel tract” off for me. There it was on the table. Curiosity overcame me and I picked it up. As I read the tract it took me back in time. I wish I had a nickel for every tract I had given out in my former Evangelical days. But this time it made me sad as I read the skewed and truncated message. It was a sad attempt to discredit the Catholic Church and to promote an impoverished Bible alone theology and gospel of cheap grace. Only Protestants hand out tracts, right? Nope! Catholic do too! But ours are a bit more substantial. 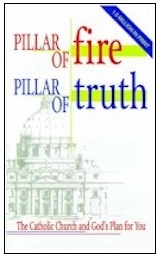 Catholic Answers has the nice little booklet entitled Pillar of Fire, Pillar of Truth which is good to hand out, but you may not be able to afford a bunch of these and they are multiple pages — a great read for someone interested but a bit too substantial to hand out as tracts. The are $1 each but with steep discounts if you buy a bunch of them. They are great! 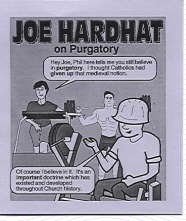 But my friend Dan Grajek has made some great little cartoon tracts you should check out. You can see a sample to the left. They are small, simple, fun to read and very inexpensive. They are great to leave with your tip at the restaurant (as long as you aren’t cheap with your tips :-). You can leave them in a phone booth, on a park bench, or in the lunch room at work. If you really want some fun, go put them on the windshields of all the cars in the parking lot of the local Baptist church between 11 AM and noon next Sunday! You can check out these tracts here. You can get a sample pack of 25 for only $4.50. The world could use the message and Dan and his wonderful family could use the money. Enjoy!